A new screen-sharing app launched today from drop.io, which keeps adding features to its private file-sharing service. 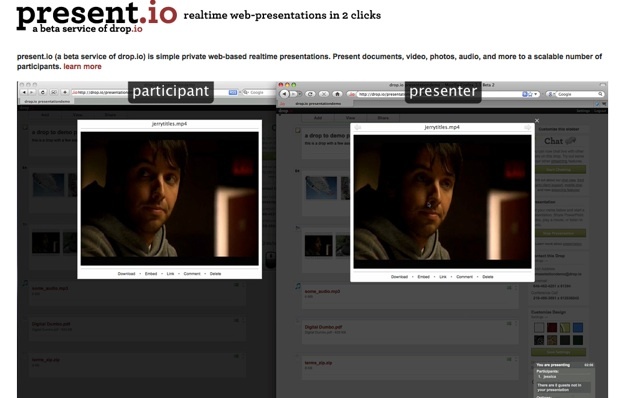 The new product is called present.io and it lets you set up a screen-sharing presentation with multiple participants in just a few clicks. Present.io has a lot in common with drop.io’s chat feature which it added last month, except that it looks like this scales to hundreds of participants and is designed specifically for webinars and group presentations. Present.io requires no downloads or installs and pretty much instantaneously tracks whatever the presenter is doing on his computer with all of the watchers see on theirs. He can go through slides, open documents via a Scribd embed, play videos, show photos, play music, and move his cursor around, and everyone logged into the presentation sees the same thing. When he is going through slides, he can expand them into full-screen mode to show greater detail, and text chat is integrated into the app at the bottom so everyone can chime in. The service also includes a live conference call line. It looks pretty slick. Try it out here. One downside is that it appears to be a one-way tool. Participants can’t take control of the presentation to add their own media or drive the presentation, unlike other free screen-sharing apps such as Adobe’s Acrobat.com (which is my personal favorite). Unlike Acrobat.com or WebEx, you don’t see the presenter’s desktop, only the files he chooses to show within present.io. So this would not be something you would use to show something in a browser, which is unfortunate because demos often default to the browser when the presenter wants to go off on a tangent or forgot to add something to his deck. Other than those concerns, present.io is a solid addition to drop.io’s ever-expanding set of features. Below is a demo video describing present.io.